The Miniature Schnauzer as the name suggests is a breed of small dogs of the Schnauzer type and it originated in Germany in the 19th century. 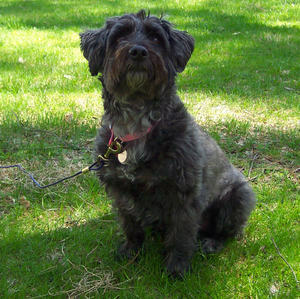 It developed as a result of crosses between the Standard Schnauzer and one or more smaller dog breeds like the Poodle and Affenpinscher. It enjoys worldwide popularity sue to its temperament and small size. It comes in four colors i.e black, salt-and-pepper, black-and-silver, and white. They measure 12 to 14 inches in height and weigh up to 11 to 15 pounds in case of females and 14 to 18 pounds in case of males. This breed has a double coat with the exterior being wiry and the inner one being soft. Moreover, the coat is short on the body, but the hair on ears, legs and belly are preserved as it is. Even though they are described as non-shedding dogs, they do shed little but it is normally unnoticeable. They have a rectangular head with hairy beard, mustache and eyebrows, dark oval eyes and forward-folding ears and thin short tails which may be docked if permitted. They are considered to be a friendly brainy dog breed that is always alert and obeys commands and have a tendency to please their owners. They are easy to train and can make for excellent watchdogs. They are wary of strangers but once their owner welcomes the guests, they become immediately friendly to them. They love expressing themselves vocally and may bark to greet their owner or when they wish to express joy, excitement, or displeasure. This breed is generally good with children. Miniature Schnauzers can take part in dog agility trials, obedience, showmanship, fly ball and tracking. Moreover, this breed possess a “high prey drive” and hence can attack other small pets such as birds, snakes and rodents.